Case studies can be purchased from: Harvard Business School Publishing and ​Ivey Publishing. A new analyst has been asked to forecast the upcoming dividends for Singapore Airlines Limited. However, unlike most dividend-paying firms, which typically maintain stable, transparent, and simple dividend policies, Singapore Airlines maintained an opaque, complex, and irregular pattern of dividends. Further, the company did not respond to requests for information about expected dividends or the company’s dividend policy. This case study attempts to identify Singapore Airlines’ dividend policy by looking at the company’s financials and dividend history, and analyzing that information in the context of the industry and its competitors. This case is designed for an MBA or advanced undergraduate course in corporate finance dealing with the topic of dividend payouts. The case could also be used in a strategy class on governance or controlling shareholders. Profit-making corporations returned cash to investors through dividends or share repurchases. Market participants labelled the fraction of the profits paid to shareholders by dividends as the “payout ratio.” However, a large fraction of firms have never paid a dividend. For instance, over half of the listed firms in the US did not pay a dividend or repurchase shares over the last decade. As a case in point, only 20 per cent of firms on the Singapore Stock Exchange consistently paid dividends over the past decade, with similar proportions observed in both US and European stock markets. The fraction of dividend-paying firms plummeted to a record-low 17 per cent in 2000. In fact, most of the “new economy” firms such as Amazon, Facebook or Google reinvest their entire earnings. The asymmetric reactions by investors to changes in cash dividends further highlighted the importance of these consistent payments to shareholders. For instance, a cut in dividends typically led to a much larger drop in a firm’s stock price relative to the price appreciation from an equivalent dividend boost. Consequently, managers often attempted to deliver persistent dividends and only increased them when they are confident they can be maintained. Investors relied on dividends to evaluate the investment prospects of the firm. A common view was that an opaque dividend policy created concerns and uncertainty among investors in the firm. Arguably, investors have used corporate dividends to evaluate and forecast the future of the firm. A plethora of research on corporate payout policies documented several regularities. Yet, it seemed that we didn’t have complete understanding of corporate motivations and investor expectations about dividends. Alibaba Group Holding Limited (Alibaba)—the Chinese e-commerce giant who, in September 2014, completed the largest IPO in New York Stock Exchange (NYSE) history—was preparing itself for an additional round of capital fundraising. This time, Alibaba focused its efforts on a large bond issue. However, Alibaba’s finance team still needed to address a number of questions. Would investors subscribe to the issue? How would Alibaba estimate the bonds’ pricing? How should the firm determine the timing and location of the new bond issue? Moreover, because Alibaba’s revenues primarily originated in China while its shares traded on the NYSE, the pricing analysis was going to be complicated by matters related to country risk premiums. Additionally, certain governance issues (specifically, variable-interest entities (VIEs) and dual class ownership structures) added to the complexities of the issue. This case is designed for an MBA or advanced undergraduate course in corporate finance, dealing with the topic of raising funds by issuing bonds. Specifically, the case can be used for a discussion of bond risks, timing, and pricing. The case also allows discussion of emerging markets (in particular, China) and bond pricing differences (country risk premiums) between China and the United States. In June 2015, the Toyota Motor Corporation’s annual shareholders’ meeting included a proposal regarding Toyota’s new share issue. Named “Model AA” shares after the company’s first passenger car, the shares would offer investors new hybrid securities. This proposal created a lot of controversy among existing shareholders. Although President Toyoda claimed that no one would be disadvantaged by these shares, it remained unclear how many shareholders had confidence in this assurance. The share issue, which would potentially comprise up to 5 per cent of Toyota’s total outstanding shares, would require the support of a two-thirds majority of shareholders. The new shares looked like ordinary shares with a “lock-up” period or preferred shares with voting rights. At the same time, Model AA shares resembled a convertible debt issue with voting rights (with a conversion ratio to be determined later). It was time to vote on the approval of Toyota’s new share issue, but the following questions lingered in the shareholders’ minds: What exactly was the difference between Model AA shares and ordinary shares? What was the difference between Model AA shares and bonds (or convertible bonds)? Finally, if the vote was approved, how should Model AA shares be priced? This case is designed for a course in Corporate Finance on the topic of raising funds via innovative share issue. Named “Model AA”, this share issue exemplifies the hybrid securities issue – a blend of 5-year convertible bond issue and ordinary share issue (with a “lock-up” period). The case includes the pricing of AA shares. Furthermore, the case also allows discussion of Asian markets (in particular, Japan) and differences between Japanese and international investors. Shuanghui’s acquisition of Smithfield was the largest acquisition of the U.S. company by a Chinese company. Soon after, the merged entity changed the name to WH Group and unsuccessfully attempted an initial public offering (IPO) on the Hong Kong Stock Exchange (HKEx). After the failed IPO, the company’s CEO and Chairman Wan Long was facing new challenges in July 2014. Should he try again to list his company via a second initial public offering? Or should he keep the company private? This case introduces and discusses the prospect and issues related to raising funds via a second IPO attempt, after the first IPO attempt has failed. Students are asked to evaluate potential reasons why an IPO attempt might fail. They are also expected to understand the basics of the IPO process, including the decision, timing, and pricing of an IPO. Finally, students are expected to analyze available options after a failed IPO attempt. This case is suitable for MBA or advanced undergraduate programs in corporate finance, as well as courses in raising capital, especially in regard to a subsequent IPO launch after an earlier failed IPO attempt. Students will also learn about the complexities of the food industry in China as compared to the United States. In the light of these dilemmas in May 2011, Dr. Zhengrong Shi, the founder and chief executive officer of Suntech, hires David King as the firm’s chief financial officer. Shi and King have to face the arduous task of turning the company around. In a corporate finance course (at the MBA or undergraduate level), the case can be used to discuss following topics: product market competition, capacity constraints, convertible debt and financial structure. In a corporate strategy class (at the MBA or undergraduate level), this case could also be used to discuss competition and industry structure as a determinant of average firm profitability. On March 1, 2012, Harsha Raghavan, CEO of Fairbridge, rushed to the meeting in his office in Mumbai, India. Top management team of Fairbridge pondered how to evaluate the potential acquisition of Thomas Cook (India) (NSE ticker symbol: THOMASCOOK). Raghavan couldn’t help feeling that Thomas Cook’s two segments had different growth potential. Analysts predicted a tremendous growth potential in travel segment, while financial segment had limited potential. Company changed ownership several times in a short time period, while stock price plummeted from recent high of INR 61.95 to the low of INR 33.30. Thomas Cook India had a 150 year history of profitable operations in India. Nevertheless, the company had changed ownership several times in a short time period, with Thomas Cook Plc selling the Indian subsidiary in 2006, buying it back in 2008 and putting it up for sale again in 2012. CEO Harsha Raghavan had to think long and hard whether the company fits the value investing philosophy rigorously followed by his superior – Fairfax’s CEO Prem Watsa, also known as ‘Canadian Warren Buffett.’ Should Fairbridge bid for Thomas Cook? How much should they bid? Is the company worth more with two segments or it is better off by demerging segments? Should they delist Thomas Cook or keep it public? Raghavan raised more questions than answers. This case is designed for a course in corporate finance on the topic of acquisition, private investment in public equity (PIPE), or a comparison between private and public equity investment. The case also allows discussion of emerging markets (in particular, India) and differences between the US and Indian financial markets. It can also be used in the course on finance strategy. On 1st April 2014, OCBC (SGX: O39, OTC Pink: OVCHY), the second largest financial services group in Southeast Asia by asset, offered HK$125 (U$16.12) per share (US$5 billion in total) to acquire Wing Hang Bank, the eight largest lender in Hong Kong. The offer represented a 49 per cent premium on Wing Hang’s share price. Three months later, on 4th July, 2014, the Wall Street Journal reported that Elliott Management, a US$25 billion hedge fund, had accumulated 7.8 per cent of the family-owned bank. According to Hong Kong’s securities law, OCBC would have to acquire 90 per cent of Wing Hang’s shares by 29th July 2014 to successfully take the Hong Kong bank private. Yet, 25 days to the deadline, OCBC had solicited only 50.4 per cent. If OCBC fell short, it would have to resell a sizable portion of Wing Hang’s shares back to the market, probably at huge discount, to comply with Hong Kong’s 25 per cent minimum float requirement. Credit Suisse predicted a 40 per cent fall in Wing Hang’s share price if the deal fell through. Elliott’s unspoken message to OCBC’s Chief Executive Officer Samuel Tsien was loud and clear: raise your bid price to buy our shares or we will keep the company public at your expense. Why is OCBC acquiring Wing Hang? Is the Wing Hang acquisition the best to achieve OCBC’s China ambitions? If yes, what is a reasonable price to pay? How should OCBC finance this mega acquisition? What will be the cost savings and new opportunities unleashed from this acquisition? Is Elliott posturing or serious? This case is designed for a course in corporate finance on the topic of cross-border (bank) acquisition and shareholder activism. The material also allows for a discussion of Singapore, China and Hong Kong financial markets. Alternatively, the case could be used in a module on financial corporate strategy. A controlling shareholder of the NYSE-listed Chinese online gaming company Shanda Games has offered a buyout at USD6.90 per American Depository Share (ADS); each ADS consists of two ordinary shares. The offer provides a premium of 22 per cent to the stock’s Friday close. Throughout the previous year, Shanda Games’ ADS had typically traded in the range of USD2.74 to 6.45. As Shanda Games’ independent directors attempt to evaluate the offer, they wonder: Should the shareholders accept it as it is? Should they ask for a higher price? Or should they look for the alternatives? This case is designed for an MBA or advanced undergraduate course in corporate finance on the topic of “going private” through a management/leveraged buyout, especially in the situation with a controlling shareholder family. The case also allows discussion of emerging markets — in particular, China — and of the differences in the gaming industry between China and the United States. Alternatively, the case could be used in a module on valuation or corporate strategy. In November 2011, Muddy Waters, a U.S. short-seller fund, accused Focus Media of overstating the size of its business. Focus Media’s stock price fell sharply at first but then rebounded as the company countered the attacks. In March 2012, however, the U.S. Securities and Exchange Commission (SEC) launched its own investigation and pressured Focus Media to amend some of its filings. A few months later, Jiang partnered with a group of private equity (PE) firms, including the Carlyle Group, to take Focus Media private in a deal valued at more than $3.7 billion—China’s largest-ever buyout. In the following months, several Chinese companies followed suit and delisted from the NASDAQ. In mid-2014, the PE funds in the consortium wanted to cash out of their equity positions, and Jiang faced the difficult decision of what to do next. Should the company stay private by going through a leveraged recap or secondary buyout of the PE stakes? Would the company be able to go public again, this time with a listing on the Hong Kong Stock Exchange? And would Focus Media be well received in Hong Kong after its turbulent history of being listed in the United States? 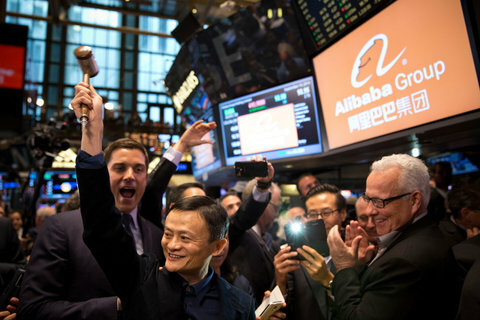 In April 2014, Alibaba’s impending initial public offering (IPO) was projected to be among the world’s largest IPOs. Alibaba faced many difficult decisions regarding ownership structure, trading location, IPO pricing and IPO timing. The Hong Kong Stock Exchange (HKEx) seemed like a natural fit for its IPO due to geographical, cultural and language proximity. Furthermore, 86.7 per cent of Alibaba revenues originated within China. However, Alibaba insisted on “partnership governance,” while HKEx did not allow listing of companies with dual-class share structure. In contrast, the New York Stock Exchange (NYSE) and NASDAQ did not object to Alibaba’s proposed ownership structure. While the Hong Kong investors knew Alibaba’s business better, the New York exchanges provided more liquidity and visibility. Further, Alibaba had to consider its valuation and IPO price: a lower IPO pricing would leave the “money on the table” but create buzz about the company, while a higher IPO price would result in more proceeds but would risk alienating the investors. Against this backdrop, Alibaba needed to make difficult decisions regarding its IPO. This case is designed for a course in corporate finance on the topic of raising funds via an IPO. The case also allows discussion of emerging markets (in particular, China) and differences between the Hong Kong and New York stock exchanges. Alternatively, the case could be used in a module on corporate governance and ownership structure — and specifically, dual-class share structure. It can also be used in a course on finance strategy along with the case “Financing Alibaba’s Buyout: Syndicated Loan in Asia” (see Ivey Publishing, product #9B14N011, June 2014). Alibaba’s 2012 syndicated loans were the first sizable loans for a Chinese technology company with few tangible assets. Creative loan covenants stated that the subsidiaries would repatriate 100 per cent of the distributable profits for debt service. The loans were partially used for the buyback of Yahoo!’s stake. In the agreement, Yahoo! would sell half of its stake back to Alibaba immediately and an additional 10 per cent during Alibaba’s initial public offering (IPO) in the next few years, and divest the remainder sometime after that. Alibaba now thinks it is time to tap the debt market in order to pay off the $4 billion in loans it received in 2012 and to finish the payments owed to Yahoo! for the stock repurchase. This case is designed for a course in corporate finance on the topic of raising funds via syndicated loans. It also allows instructors to discuss the issues of capital structure and the right structure of a loan as preparation for a potential IPO. Additionally, it can be used in portfolio management or fixed income courses that deal with the topic of pricing loans. The case also allows for a discussion of emerging markets (in particular, China). Alternatively, the case could be used in a module on corporate strategy that focuses on strategic financing choices and in a module on international finance. Emirates Airline had a financing need to fund the purchase of aircraft (A-380s). On March 11, 2013, Emirates announced plans to issue U$ 1 billion of Islamic bonds (sukuk) and U$750 million of regular bonds. These bonds seemed to have similar risks, but sukuk had 48 basis points lower yield. This difference adds up to almost US$5 million per year and seemed at odds with several conventional finance theories. This case is designed for a course in Corporate Finance on the topic of alternative and innovative ways to raise funds. Additionally, it can be used in Portfolio Management or Fixed Income classes that deal with the topic of pricing the bonds. The case also allows discussion of Islamic finance and emerging markets (in particular, Dubai). Alternatively, the case could be used in a module on international finance or corporate strategy that focuses on strategic financing choices. This case describes the challenges encountered by Nathaniel Rothschild after making a US$3 billion investment in 2010 in a family-owned business group in Asia. Scion of the Rothschild banking dynasty and private equity fund manager, Rothschild and his business associates created a LSE-listed shell company, Bumi PLC, which acquired PT Bumi Resources and Berau Coal. These were among Indonesia’s largest coal mines and the largest coal exporters in the world, and were controlled by the Bakries, a powerful Indonesian family whose patriarch was a candidate for the presidency in 2014. After losing at least 70% of his investment in three years, Rothschild eventually requisitioned an extraordinary general meeting in February 2013, attempting to remove the Bakries and their associates from Bumi's management team. Despite western-style corporate governance manoeuvres, the PE investors found it challenging to control the politically connected family in Indonesia.